To start, a corny joke: It’s time for me to think outside the box… the lunch box! Ok, now that that’s off my chest, let’s talk about catering. Meliora Catering is the University of Rochester’s catering service. While not often experienced by the student body (something Catering is painfully aware of), catering plays a serious role in the “adult” world. That is, all the people running around running this school. This is personal speculation, but my impression is that a large portion of their business comes from lunch meetings. Anyway, this article isn’t meant to be a description of Catering. I wanted to talk about some of the sustainability initiatives in Catering. In theory, Catering can be extremely sustainable, but as a service provider, it is to some extent dependent on what the customer does. An example. Were a customer to ask for silverware, glasses, cloth napkins, etc. That would all be possible, though more expensive. That said, were a customer to ask for disposables, Catering would oblige. Against financial odds, however, silverware lunches are actually quite popular. Let’s pretend that’s because of an environmental conscience. Moving on. Catering has also been working on shifting its box lunch strategy. The menu now includes local and organic options. Terrific, but perhaps even more exciting is the use of EcoClamshells. If you are a student at Eastman, you may have seen some promotional materials regarding EcoClamshells, or you may even own one! The EcoClamshell is a reusable plastic to-go container. Catering is now selling the it for $4.25 per container. You may ask, why pay for something that does what a disposable container would do for free? Once again, I appeal to your conscience, but I’ll also appeal to your bank account. Every 11th catered meal is free when you use an EcoClamshell. That’s a serious deal. Granted, you have to be a frequent user to reap the benefits, but if you are, those benefits are nontrivial. Ok, last point. Catering also offers the Green Guide to Catering! This is particularly exciting because I helped design it! So you know it’s long winded and circumlocutional. I kid. It’s great. It lays out Catering’s offerings categorized by environmental impact. So, if you’re ordering a lunch, you can look at the right-most column and pick your sustainable options with ease. Nice. Ok, so that’s not bad. In fact, I think it’s pretty decent. But it’s not perfect. If you have a way to improve Catering, I encourage you to leave your idea in the comments. Or, even better, let Catering know. They’re friendly folks, it’s ok. Their number is 585-275-7687. This week’s post has no real theme. I was looking around for something big to write about, and all I found were these factoids. Well, they’re a little most substantial than factoids, but not much. So without further ado, I present: the mixed bag. First I want to provide a little update to last week’s post on Walmart. I received no negative comments, but what’s more apropos, I got no comments of any nature. This makes it difficult to calculate percentages (division by zero is frowned upon by my fellow Pythagoreans). Grist has an interesting article on the recent supportive press Walmart has gotten. The author wants us to remember that Walmart as an organization has created much of the ruin they are now getting laurels for trying to fix. While it is probably difficult to trace the numbers back to their source, the article points out that the rise of Walmart has been paralleled by the dramatic increase in miles driven by the average American. Perhaps one of the most interesting points in the article was about the effect Walmart has had on the life expectancy of our household products. Walmart is an aggressive business partner. That’s why everything they sell is so cheap. The power Walmart has at the bargaining table is unrivaled. To submit the lowest bid or to meet Walmart’s price demands, suppliers change their processes and materials. These changes are not benign. While your toaster is now only ten bucks, it only lasts six months. Your jeans are 15 dollars, but they won’t live to see the next year. Iron desk fans from the 40’s are still spinning. The clip-on polystyrene fan from Walmart will keep you cool this summer. Only this summer. Alright, enough examples. There’s more in the article, check it out if you’re interested. Now for a bit of popular history. Meryl Streep has apparently been a major advocate for sustainable foods. She was a champion of local and organic foods before those categories even had proper names. I did not see Ms. Streep’s latest film, but it is not her latest engagement with the Julia Child character. Streep reached out to Child to help her fight the industrial agriculture lobby. To Meryl’s surprise, Julia was not interested in helping, and became incensed. In any event, this isn’t a juicy Hollywood gossip column. I just thought is was funny. Check out the details of Meryl Streep’s work here. It’s pretty interesting. Of course, the fact that a three-time academy award winner has the leisure time and money to think about and pay for good food may not say terrible much about average Jane. That’s another conversation. Shifting gears again, what do you think is a more effective way to get people to buy healthy foods, a subsidy or a tax on junk food? According to a new study out of The University of Buffalo, taxing is the way to go. Check out the link for some details on the study. My first thought is, what are the social justice implications? Junk food is cheap, and taxing it certainly disincentives it, but what of the population that buys junk food because that is the only category of food that they can afford? American’s spend a fraction of what European’s spend on food, but that’s small consolation to someone working paycheck to paycheck for food and rent. Disregarding economic efficiency, it is a social imperative to offer affordable food. If we choose to tax junk food, we need to offer an affordable healthy alternative. Two last remarks: 1) I don’t think anything I’ve said is startling. 2) Junk food is a poorly defined category; I use the term for lack of a more precise term. Topic the next: Starbucks Fair Trade. I’ve written a little about Starbucks before, but it was a while ago, so I feel justified in writing on this topic again. Last time I wrote, Starbucks was the world’s largest buyer of Fair Trade coffee. Not surprisingly, that is still the case. Treehugger has an little article about their relationships with Fair Trade suppliers. There’s nothing that really knocks my socks off in this article, but it seems in line with my post last week. In the 50’s it was the communists (reds). In the 80’s it was IBM (blues). In a galaxy far far away it was the dark side. These days it’s fear itself. There is always a menace, some other we need to fight against and fear. Even the people who resist the popular other have their dark specters. Perhaps the danger is exaggerated sometimes. Walmart and Starbucks may have a bright side. Seeing shades of gray is an energy-intensive activity. Okay, enough philosophy. I’ll end on a lighter note. 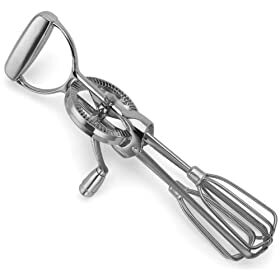 Check out this egg cracker. What do you think? Need one? I love how these product commercials always make the most mundane tasks seem intractably difficult. Cracking eggs is more difficult than watching TV (the gold standard), but it’s really not something that requires that much effort. More than that, though, cracking eggs is kind of fun. Every try two at once? That’s a party. A part of me wants to try the EZCracker. It’s the same part of me that wanted to press all the buttons on the remote when I was a toddler. The same part that wanted to touch the walls of my Aunt’s house when I walked down the hall (a sin punishable by death). These products prey on that primal interest in gadgets, that tactile glee we all enjoy. They don’t solve problems (at least not serious ones). It’s just more junk. Walmart: The Reasonable Cost of Low Price? The name of this post is taken from a documentary I’ve not yet had the chance to watch. Perhaps when I do I will regret writing this post, but till then, here it is. 1) Walmart’s labor practices have been improving: Pressured by shareholders, public opinion, and competitors (Target in particular) Walmart has upped the benefits provided to employees. I am not up on the specifics, but I can say that the present state of a Walmart employee is better than the past state. 2) Walmart’s environmental record has been improving: Walmart has been expanding an efficiency pilot program to dozens of stores. This raises the question, what is more efficient? People traveling a short distance to a small ineffient store or a long distance to an efficient store? I don’t know. 3) Walmart offers a large selection of local and organic produce: Shocking, isn’t it? I read that little tid-bit here. In particular, look at the statistics on obesity in low-income communities with and without Walmarts. The difference is small, but statistically significant. Obviously there are still issues to consider. One of the main criticisms of Walmart has been that they use strong-arm tactics to force suppliers into agreements they cannot afford. I see no evidence that that has changed. There is also the nostalgia element. I personally love the feel of my bodega. Amel and Dean run a fine establishment. I can’t imagine having a similar emotional connection to a big box store. But maybe some people do. Recommended reading: The United States of Walmart. I’ve also not read this, but I’m getting around to it. Hey, give me a break. There are many concrete reasons a person would want to eat local foods. They support the local economy, they do not require too much oil to ship, they are available fresh and in season. Many reasons. There is, however, another class of reasons to eat local. This class is more philosophical in nature. I have yet to plumb the depths of these arguments, but one has occurred to me. I present it below in the as yet immature state it has achieved in my mind. Local foods as a force for democracy. First, I want to say what I am not talking about. I am not talking about voting with your wallet. Although the impact of choosing to buy Food A instead of Food B is truly sizable (particularly when people choose Food A en masse), that is more capitalistic than what I intend to address. When I say democratic, I mean having a degree of control over the variables in one’s life. I suppose that last sentence spilled the beans. Local foods are democratic in that I have more control, with my vote, over food grown on land near me. As a general rule, the closer it is grown, the more control I have. I admit that a functional democracy is necessary for this, but hopefully critics of local foods won’t find too much evidence of dysfunction to support their claims (i.e. I hope our democracy (constitutional republic) stands up to scrutiny). Getting back to the point, if I decide that I don’t want PCBs in my food, I can work to get a bill written and passed making it illegal to produce or dump PCBs in my district. Or, I can work to support a law that would test food for PCBs. The latter scenario will cover all of my food, but the former will only apply to local foods. The more local the vote, the more power I (as a voting citizen) will have over the outcome. If I am one of 200 people to vote, I am 0.5% of the electorate. If I am one of 200 million to vote, I am 0.0000005% of the electorate. The same math applies to you as a constituent, rather than a voter. Combine that with the different types of laws made at the local and national level, and it becomes obvious how important local politics are to food issues. To make things clearer, I provide an example (from my mind, not any particular source) of how this might look. I live in Rochester, NY (true), and I want to eat apples grown in the most responsible possible way (the specific criteria are not important for the discussion at hand). If I buy my apples at the BigMart, my apples will come from Washington. It just so happens that Big Apple (the corporate force, not the state) has a lot of sway in the district of Washington where my apples were grown. They have lobbied (successfully) for deregulation of appleculture (apple+agriculture=appleculture). They don’t need to test their soils for foreign elements, and they have had the use of Chemical X, a chemical that shortens the life expectancy of their workers, legalized. That’s terrible! But the only recourse I have is to stop buying from that company. I turn to my local apple growers. They are much better, but the New York apple farmers also use Chemical X. This time I turn to my local representative. I lobby and work with an advocacy group to outlaw Chemical X. Voila! I have succeeded and now have access to apples I feel good about eating (not to mention I enjoy the taste). Democracy works. Perhaps at this point I turn to outlawing Chemical X in the entire country (and beyond? ), but that is a much larger battle. By eating local I was able to make a meaningful change in my food supply. So those are just seeds of thoughts. To stretch a metaphor beyond reason (and into schmaltz), can you water these seeds? Let’s make a tree. Oceansustenance, known to the layman as seafood, is one of the more complicated sustainable food issues. That’s saying something, I hear there’s stiff competition in that category. Anyway, you may know that Eastman (school de music) hosts a Monterey Bay seafood night one Monday a month. I must confess that I myself have never been (for shame), but seafood isn’t exactly my thing. That makes my life easier, but what about you, the loyal reader? Seafood may be exactly your thing. I want to talk about just a few things relating to seafood. It is simply not possible for me to even gloss all of the issues in this post. If seafood was in a relationship on facebook, it’s status would be “it’s complicated”. For serious. Anyway, the eponymous agency behind the Eastman seafood dinners is Monterey Bay Seafood Watch, henceforth MBSW. They operate out of a conservation aquarium (the Monterey Bay Aquarium) and work with universities, governmental agencies, and independent groups to assess the impact of popular fish (the kind people like to eat, not the kind people vote for prom king). They have a well-designed website that recommends seafood based on its environmental impact. MBSW also has a facebook page, has a twitter, offers pocket guides, and has a free iPhone app. That’s some swanky stuff! I also wanted to touch on just a few of the general issues with seafood, without going into much depth: Overfishing has caused more than a quarter of global fisheries to collapse, fishing some species to extinction. Polluted waters and an insistence on eating high trophic foods has toxified whole sections of our diet. Farmed fish experience a genetic shift (less fit for a wild environment) that makes interbreeding with wild species dangerous to those species. Trawling has been a popular method of fishing for about a century (it’s been practiced for even longer than that, but it really took off at the outset of the 20th century). Trawling manages to damage the environment in so many ways, that it’s hard to imagine a more destructive way of getting food. It is to the seafood industry what agribusiness is to cropland. MBSW offers a nice page covering just about every way you can snag a fish in the water. If I can editorialize for a moment here (I know I’ve been doing so all along, but this is my blog!) trawling has turned the fishing in the ocean into shooting fish in a bucket, and it’s managed to damage the bucket pretty badly with that gun. My last random comment will serve to bring you news from the front. I suppose I’m doing this to prove to you that action can be taken on these issues. Here’s a New York Times report on what’s happening in Europe. Alright, that’ll do it for this week. Have a good weekend, and watch your oceansustenance intake. It’s going to be a quick one today, folks. I know I’m a bit late, but I won’t be making up for it with quantity. Instead, I figured I’d go with a crowd pleaser. 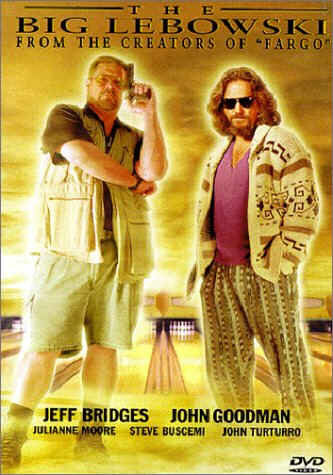 Who here has heard of The Big Lebowski? Come on, hands up. Wow, not bad. How many of you count it as your favorite movie? Holy smokes! Well, like all good Lebowskians, I’m sure you remember the line “you human paraquat!” It doesn’t so much roll as tumble off the tongue. The Dude yells this at the ostensible Big Lebowski during a certain climactic scene (I won’t give it away). Everyone loves the line, but how many of us know to what it refers? At least in the younger wedge of my readers, I’d bet the numbers are thin. The line is a reference to the spraying of a chemical known as paraquat on Mexican marijuana fields during the 80s. I won’t go into the specifics of that event, but I did want to put the statement in the thematic context of the movie. It’s beginning to make more sense, no? So what exactly is this euphonious chemical all about? It’s an herbicide! And an incredibly potent and toxic herbicide at that. There are no two ways about it, paraquat will kill your weeds, your wildlife, and (oh yes) you. It is toxic to humans (remember to wash your veggies), and the LD50 is really quite small. In some agricultural nations, paraquat is responsible for upwards of 70% of suicides. There are groups currently working on an international ban, but while global bodies dither and delay, there is a quick way to avoid paraquat: organics! I know there’s a logical leap there, so let’s take it step by step. 1) Paraquat is a lethal herbicide in wide use. 2) Organic foods don’t dabble with herbicides. 3) Organic foods bestow their non-dabbleness on their consumer. 4) If you want to avoid paraquat, go organic! I can’t speak for Jeff Bridges, but I bet The Dude would skip the paraquat and head for the organic cumquat. If you attended the Women in Sustainability lecture this week, read no further. You are now well versed in the world of phthalates (I won’t attempt a pronunciation guide). The good news: you are an expert chemist and will not have a hard time finding a job. The bad news: you are probably terrified of everyday objects. Shower curtains. Hair spray. And most ominously (not to mention relevantly), food. Phthalates are endemic in our environments. They are part and parcel with the plastic addiction from which we all suffer. Bad plastic, bad. To make matters worse, petroleum is the major source of fertilizers (roughly speaking). Since most food in a supermarket has been blanketed with fertilizers, most food in the supermarket carries phthalates. Other than the terrifying phoneme fusion, what’s to worry about? Phthalates mimic estrogen in the body. To make that statement a little more precise, some phthaltes are able to bond to estrogen receptors in the body. The effects of this are only beginning to be studied carefully, but early results coupled with some simple thought experiments (what would a world with diminished sexual dimorphism in humans (and other animals) look like?) lead to portentous conclusions. To cut off what could be many pages of rambling, phthalates seem pretty scary (I apologize for the scare tactics, it’s not usually my style), and if you are interested in avoiding them (I would consider this seriously if you are pregnant), try to avoid foods treated with pesticides, and heating food in plastic containers. There are more drastic steps one can take, but I defer to the rest of the internet (and beyond!) for that information. Good night, and good luck. Check out this paper for more info. Hello friends, sorry I’m late, but I have a good excuse. I wanted to finish reading Michael Pollan’s “The Botany of Desire” for you. (Don’t let the title of this post throw you.) I think it was well worth the wait. The book is divided into four chapters (with an introduction). Each chapter focuses on a single plant (almost) and each of these is meant to signify the fulfillment of a desire. The plants are the apple, the lily, marijuana, and the potato describing sweetness, beauty, intoxication, and control respectively. Pollan’s thesis is that Darwin’s concept of artificial selection is a bit anthropocentric. We are part of nature, not above or outside of it. Put simply, “domesticated” plants are using us as much as we are using them. It’s an attractive idea, and one that Pollan supports nicely. While the second and third chapters are indeed fascinating, they are not terribly relevant to food consumption; their reading I leave to your leisurely prerogative. The first chapter (the apple, sweetness) should have some special interest to students here at the U of R. Apples were one of the first, and certainly the most prominent local foods on our campus. Pollan helps hone our notion of local foods. Apples are most likely native to Kazakhstan. As American as apple pie? Tell that to the Almatians. My point here is that our notions are less stable than we like to think. The fourth chapter (the potato, control) focuses mainly on GMOs. That may simplify the matter more than is fair (again, I encourage you to read the book), but it suits my purposes (I’d make a terrific politician). The potato is used as the paragon of the new foods. Pollan tells the story of Monsanto’s development of a potato that contains genes for Bt, a pesticide. If you are familiar with environmental history, you are no doubt expecting Pollan to rail against GMOs at this point. He doesn’t. He is wary of the NewLeaf potato, and he worries about the rapid development of predators resistant to the pesticide, but he is dealing with two evils. At the end of the day, Pollan does not declare a clear winner: GMO or business as usual. He does advocate for organic foods, but he sees the problems with that. Pollan would not make a wonderful politician. He sees the complexity of issues, and is unwilling to pacify his readers. So there you have it: a book without answers. That is not to say it’s a waste of time though. Beyond being thoroughly enjoyable (the main difficulty was reading while laughing), it is thoroughly thoughtful. Hello everyone! How was your week? Only one more to go, and then finals. Yikes. Okay, so anyway, I wanted to write about the GoodFood Collective before the semester ends. Hey Dan, what’s that? Excellent question. The GoodFood Collective is a CSA in Rochester. Hey Dan, what’s that? Another great question! If you read my post on Elizabeth Henderson’s book “Sharing the Harvest” then you are familiar with the idea of a CSA. If not, here’s a crash course: A CSA is a way for farmers to lower the risk associated with growing food for a fickle buying population (i.e. people who eat i.e. everyone). Members buy a share in the CSA at the beginning of the season. In return members receive a quantity of food (usually vegetables, but sometimes fruit or cheese). My housemates and I bought just such a share at the end of last semester. Sometime in June we picked up our first share. There were a number of pickup locations (and for a little extra green your greens could arrive to your location of choice (I am so sorry that I made you read that)), but ours was the parking lot of Boulder Coffee in the south wedge. I would just arrive, name drop a little, and walk away with bags filled with fresh vegetables. Just about every week we got a batch of mixed greens, but other than that, the share varied week to week. We got some staples like carrots and potatoes, we got some less common foods like kale and chard, and we got some really unusual foods like kohlrabi and celeriac (note: celeriac turned out to be celery root, but it still had me scratching my head for a few days). Part of the experiment was to discover new foods. I had no idea I liked green tomatoes so much, or that they were just tomatoes that weren’t red (I know, that was dumb). I tried making new soups, new stir fries, new baked vegetables, new this, and new that! Much of it was delicious, although I admit that I am totally sick of mixed greens. What kind of a name is that anyway? Alright, I’ll stop hating on lettuce. Before the pickup each week members of GoodFood received an email listing the contents of that week’s share and offering recipes. The email even included a meditation or two on food and food distribution channels. The emails were almost as good as the food. I should point out that this was the first year the CSA operated. There were a few glitches (once in a while something was omitted from the share), but things usually went smoothly (they often made up for missed foods the next week). It should also be noted that this was a bad growing season. The true summer foods lasted only a very short while, but Good Food can hardly be blamed for that. They had members do an online survey at the end of the season, and I’m sure they got some tips for running it next year (one would be to find a way around the plastic bags the food was put in). Alright, there was a fair amount of rambling in that, so let’s try to distill out some main points. The experience was good. That’s vague. I would be willing to do it again. That’s a bit better. We found it difficult at some points in the semester to get to the market on the Thursday pick-up date, but we always managed to do it. Although the season is over, the GFC (Good Food Collective, if that’s not completely obvious (I’ve also obviated the advantage of an acronym)) has left a lasting impression on me. At the very least I am more familiar with some vegetables and how to cook them. What else I’ve learned is more difficult to transcribe. Gfkjdsharkme. No, that failed. Um, I’ve learned to appreciate food. Wow, that was almost as big a failure as the first attempt. Oh well, it’s the best I can do right now. I guess you’ll have to join a CSA and experience it for yourself. Sorry.